David Austin is a highly renowned rose breeder and writer who lives in England. His emphasis is on breeding roses with the character and fragrance of old garden roses (heaven) but with the repeat-flowering ability (yay!) and a wide modern colour range (all over it.) Could not actually think of a more perfect name for this skirt. 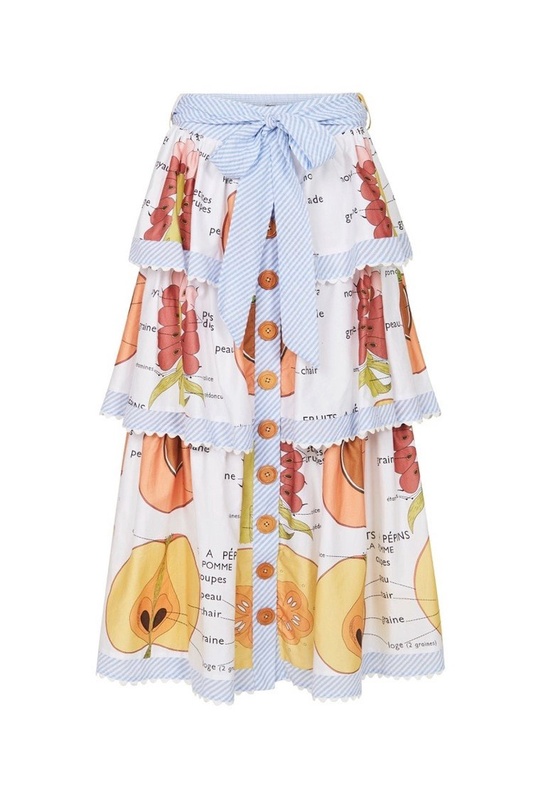 Fabulous fruit tiers finished with contrast stripes and ric rac trim in the sweetest citrus print. Retro wide wooden buttons to flash some leg, or don’t. We love it worn back with the sweet ‘Butterfly Blush’ blouse for some serious SJP action & guaranteed street style papping. Otherwise pull it right back and just wear with a simple tee, denim jacket, and some flats. Fits true to size. Elasticated back waistband, button through centre front panel and contrast stripe tie waistband. Click add to cart.